70 artists to present work at seven venues across Sydney over three months for the Biennale of Sydney’s 45th anniversary Sydney, Australia: the Biennale of Sydney today announced the 70 artists who will present work at seven venues across Sydney for the 45th anniversary of Australia’s most well-known contemporary art event, recognised for commissioning and showcasing innovative and thought-provoking Australian and international art. Participating artists in the 21st Biennale of Sydney hail from six continents including Africa, Asia, Australia, North and South America and Europe with a quarter of the exhibiting artists from Australia. The 21st Biennale of Sydney is a free exhibition spanning three months from 16 March until 11 June 2018. Exploring the curatorial theme of SUPERPOSITION: Equilibrium & Engagement, the 21st Biennale of Sydney will be presented at seven of the city’s most respected museums, galleries and non-traditional exhibition spaces: Art Gallery of NSW (AGNSW), Artspace, Carriageworks, Cockatoo Island, Museum of Contemporary Art Australia (MCA), Sydney Opera House and 4A Centre for Contemporary Asian Art. Jo-Anne Birnie-Danzker, Director and CEO of the Biennale of Sydney, added: “In 2018, we celebrate the 45th anniversary of the Biennale of Sydney, one of the leading contemporary art events in the Asia Pacific region. Under the artistic leadership of Mami Kataoka the 21st Biennale of Sydney promises to be a compelling exploration of the most urgent issues of our day through the eyes of exceptional international and Australian artists. The Art Gallery of New South Wales (AGNSW) – a Biennale Exhibition Partner since 1976 – will reflect on the Biennale’s rich history through a close examination of its archive, drawing on more than four decades of encounters with art from around the globe. In addition to the archive project, the AGNSW will present 17 artists across the Gallery including celebrated Australian artists Sydney Ball, Roy Wiggan and Roy de Maistre. Paintings by Wathaurung elder Marlene Gilson overturn the colonial grasp on Australia’s past by representing the involvement of Aboriginal people in significant historical events such as the 1854 Eureka Stockade. N.S. Harsha’s twelve-metre long mirrored commission, which assembles found cardboard packaging collected from around the world with 900 hand-carved teak elephants, will be presented alongside Cambodian art collective Sa Sa Art Projects’ collaborative work on the history of the recently demolished White Building in Phnom Penh. Artspace in Woolloomooloo has been an Exhibition Partner since 1992 and will host five artists for the 21st Biennale of Sydney, including pre-eminent Flemish painter Michaël Borremans who will exhibit a selection of intimate video works, paintings and drawings. Ai Weiwei’s Crystal Ball, 2017, considers the complex future of our world in the face of the current global humanitarian crisis. Indian artist Tanya Goel will present a selection of paintings and fresco works alongside a site-specific wall drawing. China’s Geng Xue exhibits a video work, Poetry of Michelangelo, 2015, that evokes the conversation between artist and creation, whilst Vietnamese artist Tiffany Chung will show an embroidered textile map and other artworks delineating the patterns of diaspora. In 2018 the Biennale of Sydney returns to the multi-arts precinct and former rail-yard Carriageworks for the fourth time with a series of large-scale immersive installations. UK-based duo Semiconductor will present a five-channel video work exploring the material nature of our world and how we experience it through the lens of science and technology. Other artworks presented at Carriageworks include video work by Vietnam’s Trinh Thi Nguyen, new and existing works by Pintupi artist George Tjungurrayi and a four-channel video projection by Chinese artist Chen Shaoxiong depicting familiar landscapes from everyday life. On Cockatoo Island, 20 artists will present works echoing the history of the UNESCO-listed site around movement, migration, production and participation, including works that grow or morph over the course of the Biennale. 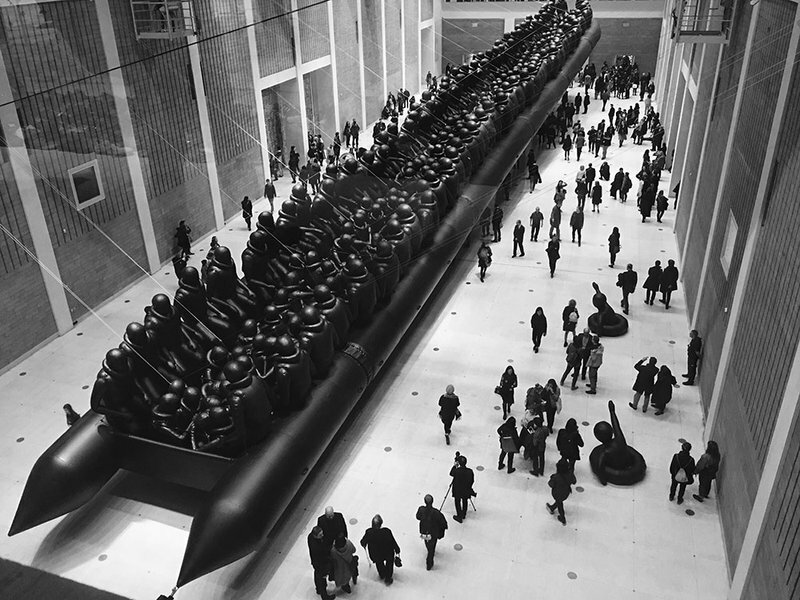 Ai Weiwei’s Law of the Journey, 2017, a 60-metre inflatable boat filled with more than 250 oversized figures, made from the same rubber used to manufacture the precarious vessels that carry refugees across the Aegean Sea from Turkey to Greece, will fill a cavernous space on the Island. Thai artist, Mit Jai Inn will create a series of new works in which the visible process of creation will be as important as the final product. Sydney artist Yasmin Smith will create a ceramics studio and open-air kiln alongside a ceramic installation featuring cast mangrove branches finished in a hand-made wood ash glaze and Melbourne artist Nicholas Mangan will present a work which dismantles accepted histories to reveal the complex dynamic between human action and the state of nature. Scottish artist Anya Gallaccio’s sculptural work will comprise a 3D printed clay mountain range, whilst Thai artist Tawatchai Puntusawasdi will present metal sculptures and two-dimensional drawings as a replica of his studio. The Island will host a series of site-specific large-scale installations: in the Turbine Hall, Japan’s Yukinori Yanagi will present Icarus Container, 2018, an immersive maze-like artwork created with shipping containers that will use mirrors to reflect the light of the sun. Japanese-born, Sydney-based artist Koji Ryui will present a site-specific work that expands on his experimentation with geometric abstraction and the spatial potential of everyday objects. British artist Ryan Gander will install a new commission, creating his own universe with replica models of artefacts from his life. Lebanese-born, Sydney-based artist Khaled Sabsabi presents Bring the Silence, 2018, a five-channel audio visual installation that offers an intimate insight into practiced customs at sacred Sufi burial sites. The Museum of Contemporary Art Australia (MCA) will present the work of 18 artists across two levels of the museum, including interdisciplinary Australian artist Brook Andrew with a new commission of five sculptures, each representing one of the five elements of the universe according to the philosophy of Wuxing – central to the 21st Biennale of Sydney curatorial concept. The MCA exhibition features South Australian Ngarrindjeri artist Yvonne Koolmatrie’s intricate sedge-woven burial baskets which are a synthesis of traditional knowledge and contemporary innovation, a new work by Yarrenyty Arltere Artists from the Western Arrernte community arts enterprise in Alice Springs and shell-worked slippers by Bidjigal artist and elder Esme Timbery. From Finland, Tuomas Aleksander Laitinen will present a new commission, continuing his research-driven practice which scrutinises global systems, focusing on the correlation between large-scale networks and local events utilising light, sound installation and the moving image. American artist Liza Lou collaborates with KwaZulu-Natal women to present a complex, hand-woven bead installation representing clouds, whilst Australian artist Tom Nicholson will add to an existing wall drawing: a matrix of painstakingly handwritten words narrating a geo-political history of the 20th century. Canadian artist Ciara Phillips presents a working printmaking studio and Swiss artist Marc Bauer will present an installation incorporating a site-specific wall drawing, works on paper and ceramics. Hong Kong artist Nicole Wong will exhibit marble works that draw on google searches. The 21st Biennale of Sydney returns to the Sydney Opera House in 2018, marking 45 years since the two Australian cultural institutions were both inaugurated in 1973, with the first Biennale forming part of the opening celebrations of the Sydney Opera House. Together with the Biennale, the Opera House will co-present the Biennale’s keynote address by internationally-celebrated Chinese artist Ai Weiwei on 15 March. The Sydney premiere of Ai Weiwei’s new feature-length film Human Flow, 2017 – his heartbreaking exploration of the global refugee crisis, filmed over the course of a year in 23 countries – will also be presented on 15 March at the Sydney Opera House in partnership with Roadshow. With April 2018 marking 100 years since Sydney Opera House architect Jørn Utzon’s birth, Lebanese artist Rayyane Tabet will present a performance reflecting on Utzon’s architectural and design practice. British artist, Oliver Beer presents a new iteration of his ongoing Resonance Project within Utzon’s masterpiece, exploring the complex relationship between sound and space. 4A Centre for Contemporary Asian Art will present a video work that documents a participatory event by Japanese theatre-director and artist Akira Takayama who has invited residents of Sydney to perform a song passed down through their family, at Sydney Town Hall. The Biennale invites community engagement through a comprehensive schedule of public programs including daily guided-tours, artist and curator-led talks, lectures, workshops, panels and screenings as well as the opportunity to contribute memories to the archive. The full public program of events will be announced in early 2018. For further information and to request interviews with Mami Kataoka, Biennale artists or Biennale spokespersons, please contact: Kym Elphinstone, kym@articulatepr.com.au +61 421 106 139, Julia Barnes, julia@articulatepr.com.au +61 402 678 589, or Jasmine Hersee, jasmine@articulatepr.com.au +61 406 649 393. Media images are available at https://drive.google.com/open?id=1fUpaIVOGMZ1fCOkG6BMSQy627YDehJ88. For high resolution images, please contact our media representatives.